Airbrush makeup is one of those luxuries that most people only consider for a special occasion. Recently, however, distributors have made this small luxury easily accessible to the everyday consumer at affordable prices. 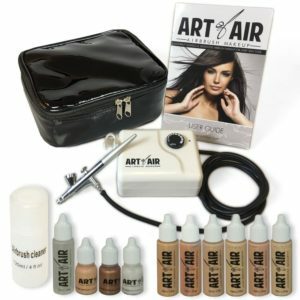 I recently purchased one of these affordable kits called the Art of Air Airbrush Makeup system. Here are a few thoughts. Disclosure: I purchased this product with my own money for personal use after researching various airbrush makeup systems. All opinions are my own. Product links within this article are Amazon Affiliate links. These links help support the financial cost of this website. Mini airbrush compressor (12V DC with a 110V AC plug in Adapter) with fully adjustable airflow control settings. The compressor also includes a 6 foot rubber airbrush hose and airbrush holder. Single-action gravity feed airbrush with a 0.4mm tip and 1/16 oz. cup. 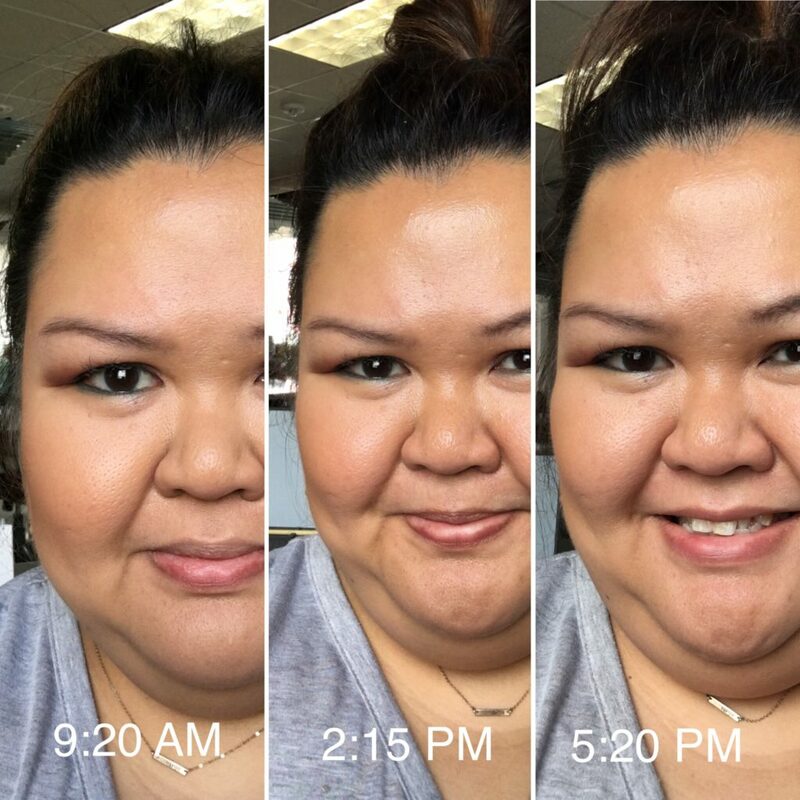 Fair to Medium Foundation Set that includes 6 bottles (½ oz each): Golden Olive, Sand, Honey, Buff Beige, Suntan Glo, and Moca. According to the Art of Air website, this kit was created for the professional in mind, but it’s easy enough for the at-home user as well. The Art of Air Airbrush cosmetic system isn’t very complex, which is not meant to be an insult. Sometimes simple is better. It’s like most standard airbrush systems. It has the compressor, which is lightweight and compact. The 6 foot rubber hose transfers the air from the compressor to the airbrush. The 6 foot rubber hose slips onto the fittings for a snug fit. This component is pretty basic and can probably be replaced easily if yours becomes damaged. The airbrush hose attachments are not complex either–you just slip them onto the fittings and you’re good. And even if you decide you don’t want to deal with 6 feet of rubber hose, you can probably cut it down and still be ok. The hose itself appears to be standard rubber hosing that you can purchase from most hardware stores if you ever need to replace it, just make sure you ask for the right size. Ultimately what this boils down to is this: it’s a system that can be maintained easily and last a long time with a little tinkering and some knowledge. There’s nothing too extraordinarily high tech to have to deal with. 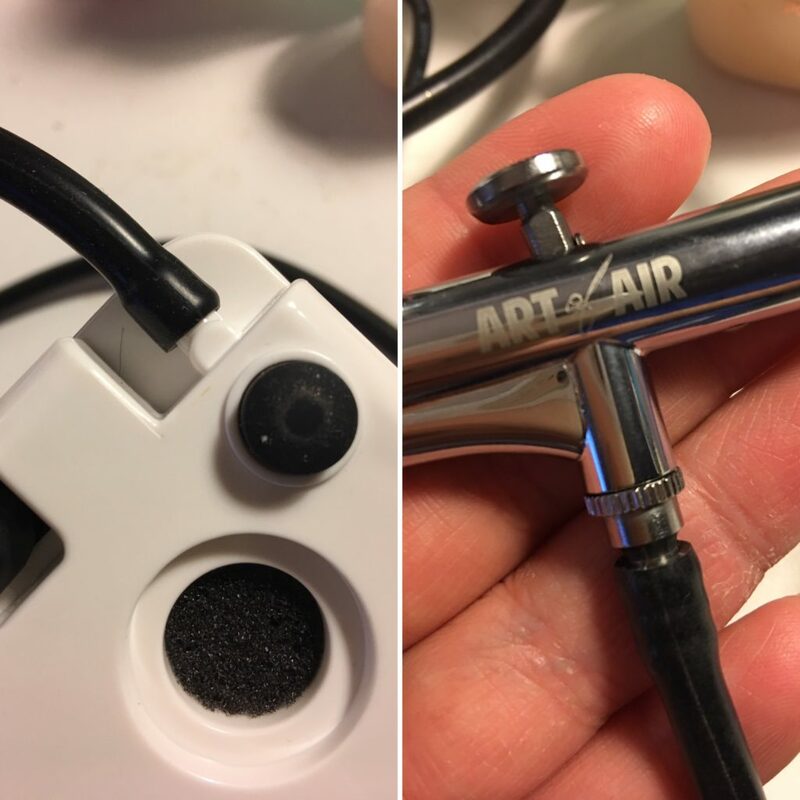 If the airbrush gun clogs, the Art of Air has provided some helpful documentation on how to troubleshoot it. The airbrush cosmetic system kit that I purchased comes with 6 different 0.5 oz bottles of foundation: Golden Olive, Sand, Honey, Buff Beige, Suntan Glo, and Moca. For the at-home user who is new to airbrush foundation, this is the most valuable part because it allows them to find the perfect match via trial and error. However, for very pale or very dark skin tones, this can still be a challenge because most of the shades included are for medium to light skin tones. Optionally you can purchase additional bottles of Art of Air foundation to expand your color range, each retailing for about $9.99 from ACM Global via Amazon. Have you ever purchased an inexpensive product and discovered that the documentation materials were inferior? Sometimes they’re even just instructions printed on cheap copy paper and not even edited for grammatical correctness or accuracy. The documentation for the Art of Air airbrush makeup kit is quite the opposite. It contains a 6 page, full color user guide that shows you how to setup, use, and clean the airbrush, step-by-step. An airbrush spec sheet that has a cross section diagram of the airbrush gun. An ingredient list for the foundation, bronzer, pearl shimmer, blush, primer, and airbrush cleaner so you know exactly what you’re using on your face and in your airbrush system. A packet with a troubleshooting guide and several pages of airbrush makeup application tips. The Art of Air airbrush makeup system comes with a wide array of foundation colors for those whose skin tone falls in the light-to-medium range. It also comes with a copper-toned, shimmery bronzer, a pearly white, shimmery highlighter, and a bubblegum-pink blush. One would think that you could purchase additional colors from Art of Air, but those are the only colors they offer. So if you want a different kind of blush, you’ll probably have to purchase from another company’s line. For those who want a versatile airbrush kit that can do both facial makeup and full body (i.e. spray tan) applications, this one might be a challenge. The 1/16 oz. cup is small and will require you to constantly refill for full body makeup. However, if you can find an alternative spray attachment that will handle the capacity and connect to the basic connector hose, then you’re in luck. So within a week of purchasing my cosmetic airbrush kit, I was tooling around with the spray attachment when I accidentally bent the tip of the needle. Accidents happen so I went on a hunt to try and find a replacement. The Art of Air didn’t have any listed on their website, so I searched Amazon and even online art retailers for 0.4 mm replacement needles. I discovered these were pretty difficult to come by. I found 0.2 mm, 0.3 mm, and even 0.5 mm needles, but I couldn’t find any 0.4 mm needles. I’ve reached out to the Art of Air via email, but because it was late on a Friday, I don’t expect to get a response until the following week. Hopefully they’ll be able to tell me some more information about replacing this particular component. I’ll update this section as soon as I hear back. In the meantime, I’ve managed to tinker with it enough to where the trigger doesn’t stick and application works smoothly. Still I’d like to get this part replaced ASAP (and possible have another spare on hand for the future). 05.07.17 Update: I received a response from the manufacturer and they offered to send me a replacement needle free of charge. They didn’t even pepper me with questions about when I purchased the product or where I purchased it. They just said they can send me a replacement and asked for my address information. I was impressed! On Friday, my package was waiting for me. The needle was contained within a secure plastic container and wrapped in several layers of protective bubble wrap. Now my airbrush performs perfectly! I’m impressed with the Art of Air system. It’s compact and comes with a carrying case and a complete set of products to try. For the price, this particular kit packs a lot of value. The quality of the machine is about average, maybe marginally better. The spray attachment produces a fine mist of foundation that seemingly floats on top of the skin for a feather-light application. The quality of the foundation is nice as well. In fact, I would probably repurchase foundation from them when I run out. Unfortunately, their bronzer, highlighter and blush leave more to be desired. Below are some snapshots of how the foundation looked throughout the day. 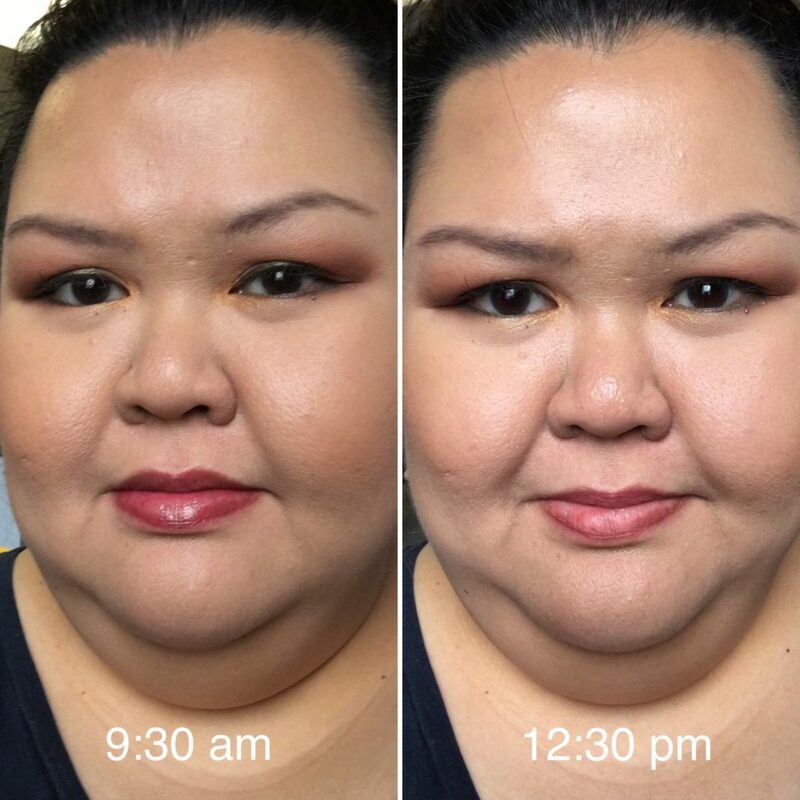 Snapshots of airbrush makeup throughout the day. You can see my skin does get a tiny bit oily as the day goes on, but that’s typical. The staying power is comparable to traditional foundation, with some fading around the chin and mouth (probably from lunch). And this is without finishing spray. The following day, I did traditional makeup, which I applied with a brush, just to compare. Here I used Stila’s Stay All Day Foundation in Honey. Again, oiliness and fading areas were similar. However, because this was a creamier makeup, it felt heavy on my skin. I preferred the airbrush foundation over this one.